Hello fellow Camaro enthusiasts, I want to dedicate this thread to EvilBee's build. But before I introduce her, I would like to introduce myself and why I love Camaros so much. Ever since I have memory, my hobby has been cars. Naturally, I started choosing my first car four years prior to me even getting a license (gotta love the internet!). All I wanted was a fast car that handled well. My choices were either an M3 or a 370Z. I loved the downshift rev-matching feature in the Z and that it has room for lots of upgrades. But what I admired about the M3 was that it was a perfect car from the factory. So when I got my license and was finally able to drive, I started to look for my first car. I saw a few 370Zs, but I didn't like the seating position. I sat in an M3 and it just seemed like the perfect car, and I was convinced that that's the car I wanted. Then, we went for a trip to L.A. where I started to notice all of the muscle cars. I started seeing Mustangs and Camaros everywhere. Now, I was never a fan of muscle cars before; I was more European-oriented. But, slowly, muscle cars started growing on me. I first started looking at Mustangs. I searched online for dealers that had a 5.0 in their lot and found one that I liked. However, I was disappointed. The car looks scary from the outside (good thing for me). However, the interior of the car is terrible IMHO. It felt like if I was sitting in a family saloon, not in a 400+ hp beast. That, and many other factors pushed me away from the 'stang. On the same day we checked out a Chevy dealership. And there it was, a beautiful 2011 2SS L99 in black with beige interior. The car looked amazing! And when I sat in it, I immediately fell in love. Yes, the interior and exterior was all plastic, but it all didn't matter. Standing there in front of such a beautiful car, something in my heart caused it to beat faster. Then, the saleswoman got the car key and asked if I wanted to take it out for a test drive. When I turned the key and heard the L99 roar to life I knew I was in THE car. The way the car drove and sounded made it a no brainer. After that test drive, the Camaro SS became my favorite car. That's the car I wanted. That same day I started browsing online and found the amazing community that camaro5.com is and started to learn more and more about Camaros. Fast forward one year later, and it was time to get my own Camaro. I was looking for a manual, specially after test driving 2 in Houston. My sister told me she saw a black SS in a car lot on her way to school and that I should go check it out. Next day, I went to look at it and, well, it was love at first sight. She is a black 2010 2SS/RS with IOM stripes and IOM interior. That, IMHO, is the best color combination! I couldn't believe that I found my dream combo, considering how rare finding a clean used SS was back when I got my car. It was a no brainer, and two days later, the deal was closed. My car came with a spoiler that didn't look tOo bad IMO but had terrible build quality. That's why I decided that the first thing I needed to do was to replace it. I was deciding between the Z/TA, 3D Carbon, SLP, and ZL1 spoiler. The Z/TA I was unable to contact phastek nor the producers to check for availability. I loved the 3D carbon spoiler but it is attached to the car via 3M tape, which to me was a big no! So it was between the ZL1 spoiler and the SLP High Lip. I ended up going with the latter because its a direct bolt on while the ZL1 required drilling new holes. I purchased it on slponline.com . The quality of this spoiler is excellent, and I would recommend it to anyone. What I loved about this spoiler is the way it resembles the ZL1 spoiler but in a more "curved" way. Instead of sharp edges at its ends, it has smooth curves that blend in perfectly with the car's rear end. As you can see the spoiler came unpainted so I decided to paint it glossy black to match the car's color. Unfortunately, when we removed the old spoiler, we found that it had damaged not only the IOM stripes along the its edges, but also the trunk's surface. I had no other choice but to re-paint the whole trunk. All of this was done at Razzico body shop which I strongly recommend. And here are a few pictures of the spoiler installed. My second mod was installing a front license plate. Driving a Camaro and being young means one gets too much attention from the police here in Lebanon. Add to that not having a front license plate meant I was virtually stopped everyday by the police . For me, adding a front plate to such a beautiful front ends ruins it and my car had never had a front plate installed before. Fortunately, I stumbled upon a company that does mounts for the front plate that are mounted in the bottom of the front bumper. This meant that I had the choice of either having the plate showing or hidden. There were two options electric and manual. Price difference was about $100 so I decided to go for the electric one. I bought this item off amazon.com. Its name is Show N' Go license plate. I read many reviews about the electric version having problems mainly when exposed in water, and was warned by my buddy Pierre777 that his mount stopped working after the first wash. I still decided to go for the electric version. When installing, I was careful enough to hide away any bare wire and connections in order to keep water away from them. I found out that if you drill the holes for the cables close enough to where you are going to mount the mount, and that you use all of the insulation provided in the kit, the system works perfectly. Also, each time I washed the car, I was careful enough to place a plastic bag around the whole mount and managed to direct water away from the system in order to prevent water from entering the electric motor. Overall, the mount works perfectly and I never had any issues with it. Unfortunately, I scraped it as I went down an inclined street and damaged the cable that joins the plate with the motor. The electrical system still works, I only need to replace the cable. If there is something I hate on sports cars is chrome. To me, chrome should be installed only on luxury cars and family SUVs. That's why I've decided to get rid of all of the chrome in my car. First, I started to work on the bowties. I wanted to paint them matte black and so I decided to use a product similar to plastidip in order to test whether I liked the way they looked. The product name is ArmorAll Shield which I purchased from BHV in CityMall Dora. Overall, I think the car looks much better this way. I'm still deciding whether I should keep the gold part black or not. But the chrome looks much better blacked out. The previous owner of the car did a sick paint job to the engine cover and fuse box. He even had the name EVILBEE on it which is why I kept the name. Unfortunately the cover's paint started to peel so it was time for a replacement. I decided to go for a cleaner look though. I opted for a matte black and Inferno Orange glossy combination for the engine cover as well as a matte black finish for the fuse cover. The job again was done at Razzico body shop. So the next mod came as a gift from my big brother Pierre. I can't thank him enough, not only for this, but also for being such a good friend. 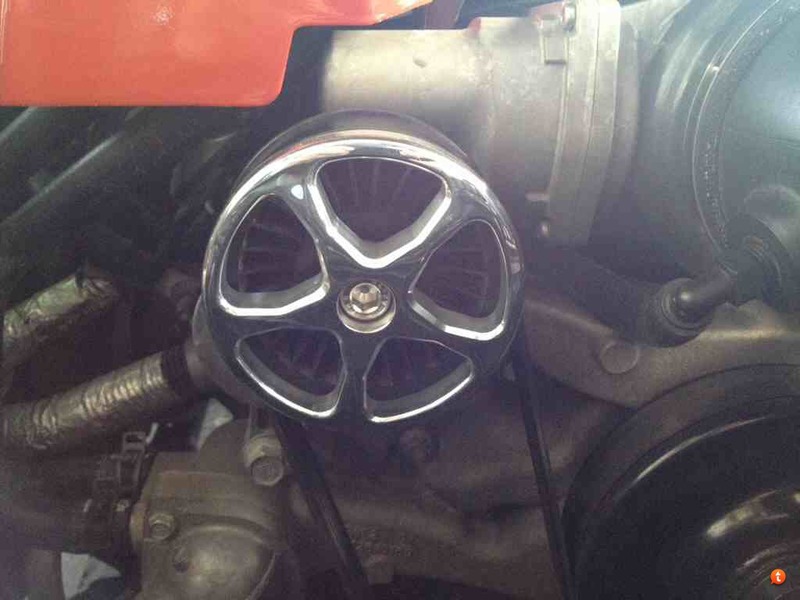 It is an engine pulley cover that comes finished in chrome. Personally, I think it looks wicked and really enhances the look of the engine bay. Install was performed by IMPEX. Sorry for the long read and my terrible english! Last edited by paul44; 01-16-2015 at 01:06 PM. Thank you bernz! Pics coming soon! Next, I removed my stock resonators and replaced them with a Magnaflow muffler. I also removed the secondary cats. The sound didn't get louder; on the contrary, it became a bit quieter, but it definitely added depth. The previous owner had removed the stock mufflers, so it was already loud when I purchased it. However, I still wasn't happy with the sound. I decided to remove the rest of the cats and perform a tune to prevent errors with the oxygen sensor. All of the piping for the decat was performed by Pistolli and the quality of the work is top notch. The whole process took about 2 hours but was well worth the wait. I know these numbers are very optimistic, but this is the only dyno in the country so I'm stuck with these numbers. Stock SS (L99s) are getting about 360 rwhp here in Lebanon so it is approximately a 40 rwhp increase (I already had a Roto-Fab CAI). Not sure about the dyno results, I decided to test vs. a stock SS and was impressed by the results. The car is definitely faster. I would recommend the IPF tune to everyone! Thanks guys for all of the support! Been gone for a long time, but it's time to update my thread with my newest mods. The car is now sitting lower with BMR 1.4" drop springs. A huge thanks to the BMR staff and specially Kyle for helping me throughout the whole process. I couldn't be more satisfied with the new stance and handling. I have huge back problems and can tell you that the ride is not stiff at all and I can barely feel the difference from stock. Then decided to install JBA Long Tube headers with no cats. I'm very satisfied with the build quality of JBA and with the results I got. Not only did the sound drastically change at WOT, I also felt a small HP gain over my previous horsepower. 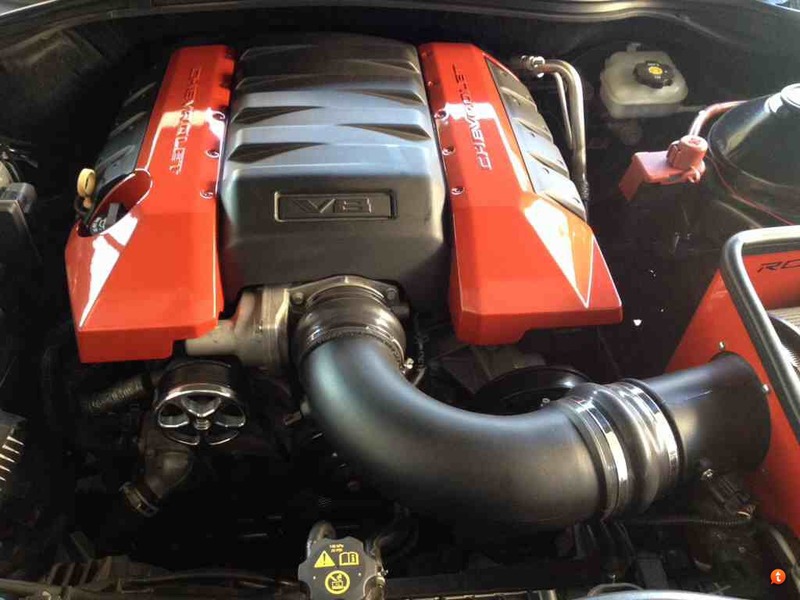 Of course, I updated my tune at ProTune Lebanon (IPF custom tune) which are the best in the country. Videos and dyno sheet coming soon! Here's a picture of my current set-up. I forgot to mention that I also added an SLP lip few months back. Currently the car is in the shop getting upgraded with an AFM3 camshaft package, SLP under drive pulley and few other mods. I'll update this thread once the install is finished! Camshaft was successfully installed as well as springs. Tomorrow we should start the beast for the first time! Can't wait! Finally I got my car back. I had to take it from the first shop that was building my car to another shop. This was due to the first shop's lack of professionalism. Long story short, I had to pay over $1k in repairs just from the things that the first shop broke. Anyways, the AFM3 camshaft is finally installed coupled with LS3 lifters. We also installed SLP 25% underdrive pulley and high tension belts. MSD wires were also installed. Results were 460/430 at the rear wheels but without a fan (stupid electricity in Lebanon). I'm sure it should be in the 470/440 with a proper fan.